PRODUCT DESCRIPTION: This one-of-a-kind lure is used to attract bats to bat houses so they will recognize the potential of the house as a place to reside. 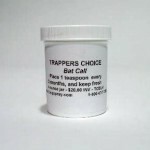 Designed by a professional animal relocator, this lure uses bat guano (bat droppings) for its base but adds "secret ingredients" to produce a safe, stable natural scent which includes bat "markers" common to roost sites. The science is simple. Bats use scent for a many reasons. And though we know bat scent is used to send messages, we still have much to learn. But it is clear bats use smells to communicate. Bat call is harvested from established colonies where these scents are in use. By adding some to your bat house, you'll be sending out a "signal" to foraging bats so they will be able to find it sooner and therefore be more likely to utilize your offer. If you reside in a part of the country where bats leave for the winter, Bat Call will probably work best in the spring and summer months. Apply 1/2 ounce on the landing pad of any of our houses and then another 1/2 ounce between the chambers. Be sure to spread it evenly over these areas which will create a light, uniform scenting – much like that which would naturally happen over time. If you reside in the south where bats are active throughout the fall and even into the winter months, apply some quarterly. Many of the southern zones have mild winters through which bats remain active. Geographical areas like this are more likely to have bats year round so applications of Bat Call will not go to waste. WHERE TO USE IT: For all our Small Cedar Houses, Large Cedar Houses and Medium Plywood Houses, you only need to use 1 ounce per application. Apply Bat Call to the house as described above; spread 1/2 ounce on the landing pad and then another 1/2 ounce inside on the dividing chambers. If you have or plan on getting one of our Large Bat Houses, you will need to use 2 ounces per placement. These Large Bat Houses also require more scent. 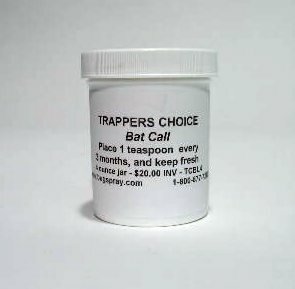 HOW TO STORE IT: Bat Call will last indefinitely when stored at room temperature or cooler. Keep it out of rooms in excess of 85 degrees. Be sure to keep the lid tightly secured to ensure freshness. Freezing temps will not hurt it but heat will degrade it so avoid direct sunlight or over heated sheds.